On it's second round, Riyadh Fashion Days is coming to life very soon, featuring an exciting variety of local and regional designers in the fashion industry.This time around, the event will be conceptualized as a Showcase. 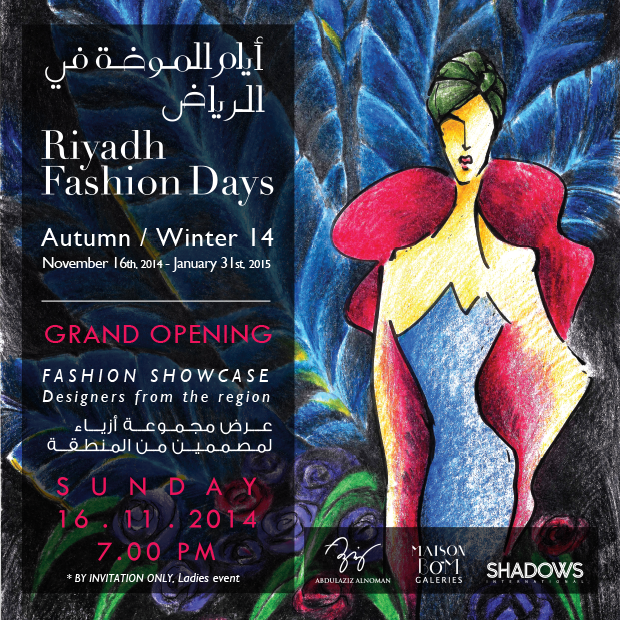 Riyadh Fashion Days will be a talent-hunt opportunity like no other.The vision is to establish a solid ground for the Saudi fashion industry through an outstanding Fashion Design Competition that highlights local talents.Many local designers have made their footprints in the industry through Maison Bo-M and they want to showcase the various pathways each designer has gone through. Riyadh Fashion Days will become a fashion talent hub for all those interested in moving forward in the industry, in which solid grounds are being established.Therefore a big part of the event will include workshops, talks and panel-discussions by prominent educational institutes in the local and regional market. Venue : Maison Bo-M Galeries, Nojoud mall, Riyadh, Saudi Arabia.